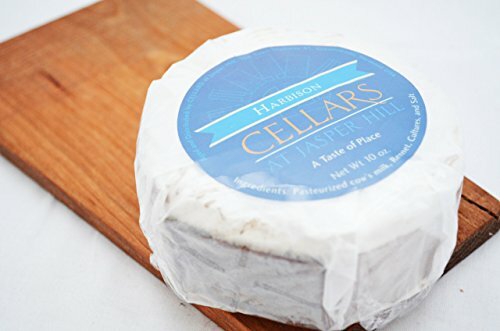 The fine cheese makers from Jasper Hill in Vermont have released one more magnificent cheese from their famed cellars. Harbison is a small format, soft ripened cheese wrapped in tree bark pulled from the woods surrounding Jasper Hill. The result is a creamy, sweet paste with notes of wood and herbs. Cut the top rind off for serving at parties or as the centerpiece of a cheese plate; scooping out this lovely paste is a transcendent experience. Ideal for cheese plates before or after a meal. 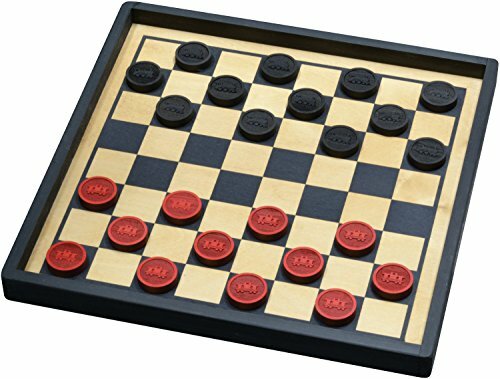 Combine our Premium Checker Board with black engine and red caboose checkers and you have our Premium Train Checkers Set. Board is crafted from 1/2" thick high quality birch plywood and measures 15-3/4" square with 1-1/4" high clear wood sides. Printed playing area is sealed with clear non-toxic finish. Each wooden checker measures approximately 1-5/8" diameter by 5/16" thick with one smooth face and a laser engraved design on the other. A cloth pouch for storing the checkers is included. Great gift for any occasion, including birthdays, graduation, or anniversaries. 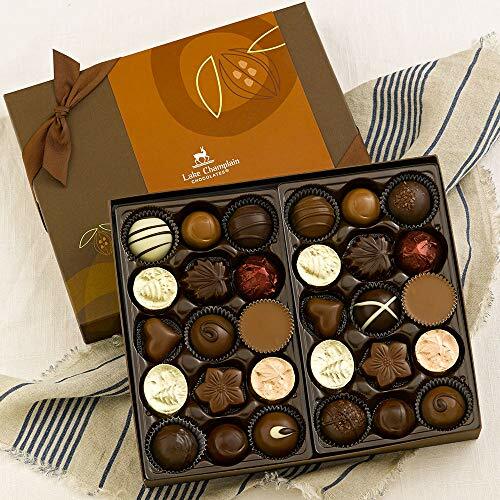 Luxurious gift box filled with gourmet chocolates. Our most popular chocolates are all included: mouth-watering truffles; luscious bonbons; crunchy sea salt and almond flower; epicurean peanut butter cups; salted caramel latte heart; and delicious Chocolates of Vermont. 30 pieces. 1.1 lbs. Kosher. 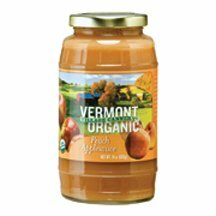 Vermont Village Organic Peach Applesauce, 24 Ounce - 6 per case. 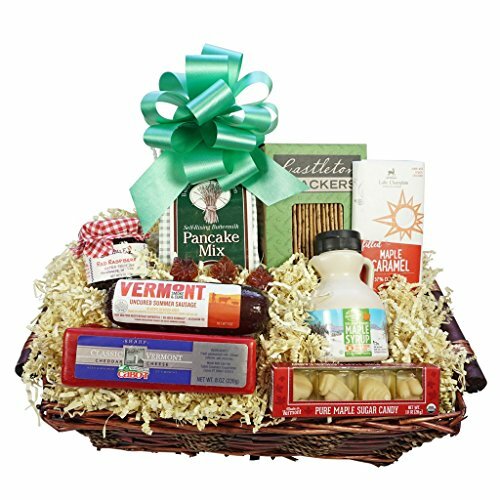 Let your friends a far know how wonderful Vermont is by sending this delicious Vermonter basket. In the package, they will find all of the necessary Vermont goodies to get a taste of the Green Mountain State. 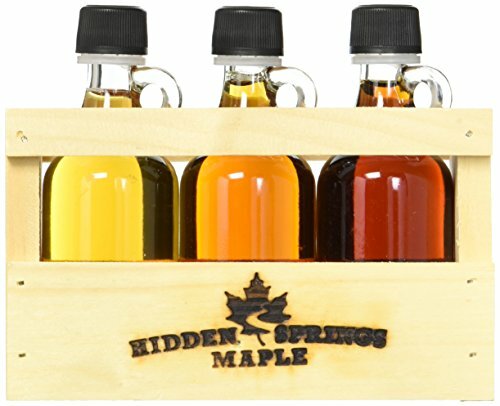 Three 50 ml (1.7 oz) gallon glass bottles, one filled with each of the three grades, golden delicate, amber rich and dark robust all set inside a hand-made wooden crate designed to let the syrup colors show. Kosher certified. Life's too short for matching socks. 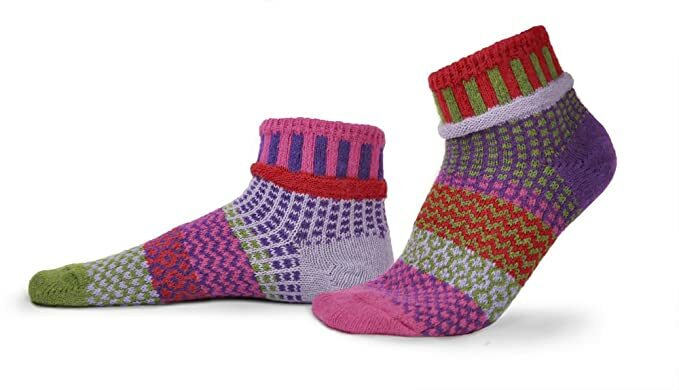 A sock wardrobe essential, these magical bursts of knitted colors are sure to make a statement, no matter the occasion. Wear them while snuggled up on the couch or while you're out and about in sneakers. Made right here in the USA, Solmate Socks'; unique styles and patterns are the perfect way to bring some cheer into your life. Comfort and fun, at the tips of your toes! Our wildly popular ankle socks have so much zest and flare - they're the perfect addition to anyone's wardrobe. Wearing these is sure to put an extra smile in your day and a little pep in your step! Saving the planet, one sock at a time. Committed to protecting the environment, we pride ourselves on being an environmentally friendly company. Each product is knit with 100% recycled cotton yarn so you know you're purchasing socks from a company who cares about the environment. We pride ourselves on creating quality, wearable art to inspire happiness all year round. If you're looking for the perfect gift for a special someone, or even yourself, buy a pair of our unique, mismatched socks and you won't be disappointed! "an extremely creative and clever design." "the colors are so vibrant, and the pattern is so pretty." No family member left behind. Solmate Socks creates fun and beautiful socks for Adults, Children and Babies, so no one gets left out! Ankle Socks, Crew Socks, Knee Socks...there's a sock style for everyone. And the fun doesn't have to stop there - outfit your crew with hats, gloves and scarves to match. GET YOUR SOLMATE SOCKS TODAY! 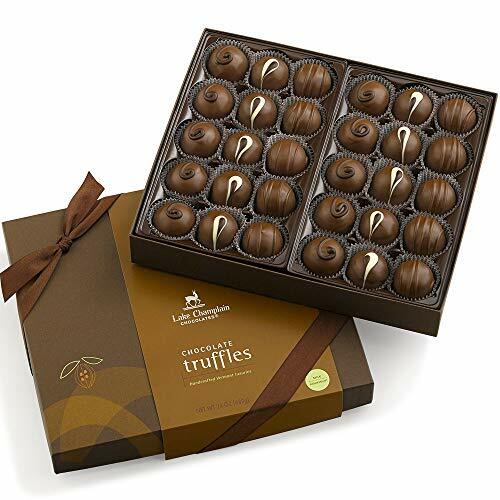 Give the gift of fresh gourmet chocolate truffles. Nothing compares to the combination of creamy milk chocolate, fresh Vermont cream, sweet butter, velvety smooth ganache - all blended into delightful symphonies of satisfaction. Milk chocolate flavors include: All Milk, Cappuccino, Hazelnut. Kosher.